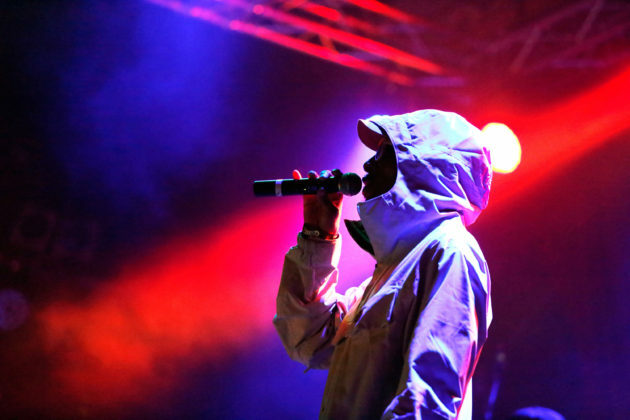 Oakland-born underground hip hop artist Del the Funky Homosapien performs on Sept. 23 at the Catalyst Club in Santa Cruz. 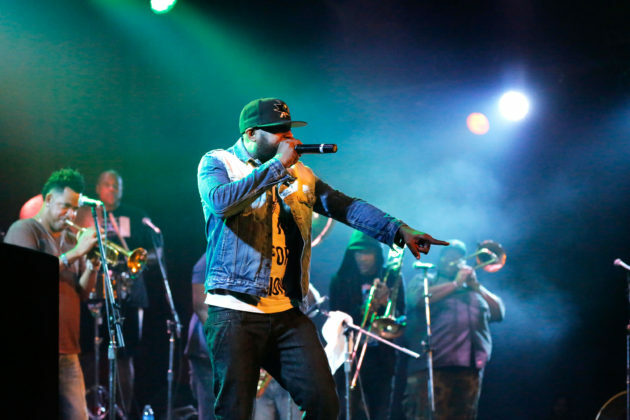 Del, who is the cousin of rapper Ice Cube, opened for the Soul Rebels and Talib Kweli. Photo by Stephen de Ropp. Up-and-coming Bay Area Rapper Pure Powers took the stage at the beginning of the night, performing original songs from his new album “One Dream.” Photo by Stephen de Ropp. Members of The Soul Rebels groove with the rhythm just before midnight on Friday evening. Several hundred people attended the multi-genre event held at the Catalyst Club. Photo by Stephen de Ropp. Talib Kweli performs at the Catalyst Club in Santa Cruz on September 23. Photo by Stephen de Ropp. After rapper and DJ Metro Boomin’ took the main stage of the Catalyst Club last Thursday night, hip-hop took a step away from the top 100s and backtracked a few decades. One day later, a handful of passionate hip-hop artists performed Friday from 9 p.m. to nearly 1 a.m. MC’ing, 2pac covers and even beat boxing brought the ’90s back in full force. 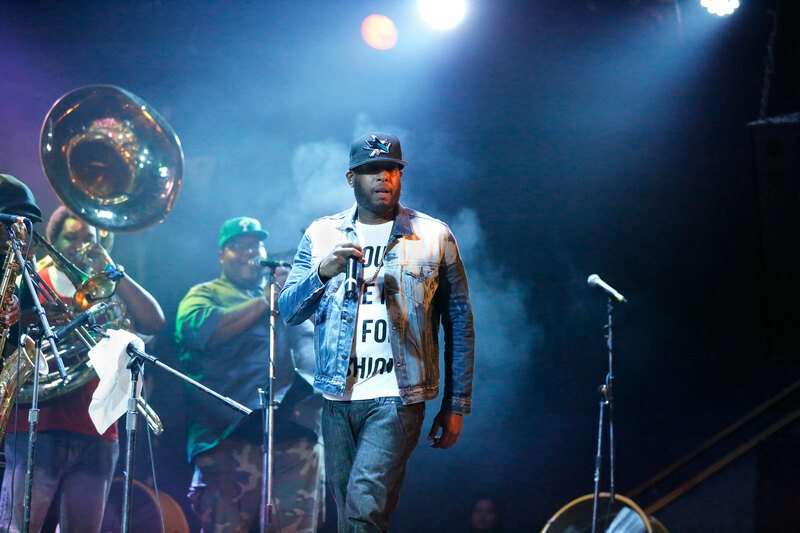 The Soul Rebels, a New Orleans-based brass ensemble, closed the show. The members strolled on stage with saxophones and trumpets in hand, leading the crowd in a synchronized shimmy. The 8-piece band of experienced musicians put down their instruments behind the scenes. They have normal jobs when not on tour — as fathers, music teachers and veterans. Each sporting graphic T-shirts and jeans, the group disregarded uniforms and danced to their own beat. They brought a warm, comfortable energy to the stage with their jazz and pop influences. Young and old gathered around, couples twirled and people crowd surfed, as the Soul Rebels played their nearly 2-hour long set. The Soul Rebels don’t define themselves by a genre but move with the tide, finding themselves in new, more fluid musical environments all the time, said Soul Rebels co-founder and snare drummer Lumar LeBlanc in an email. Artists from Miles Davis and Billie Holiday to Dr. Dre and Jay Z influence their sound. 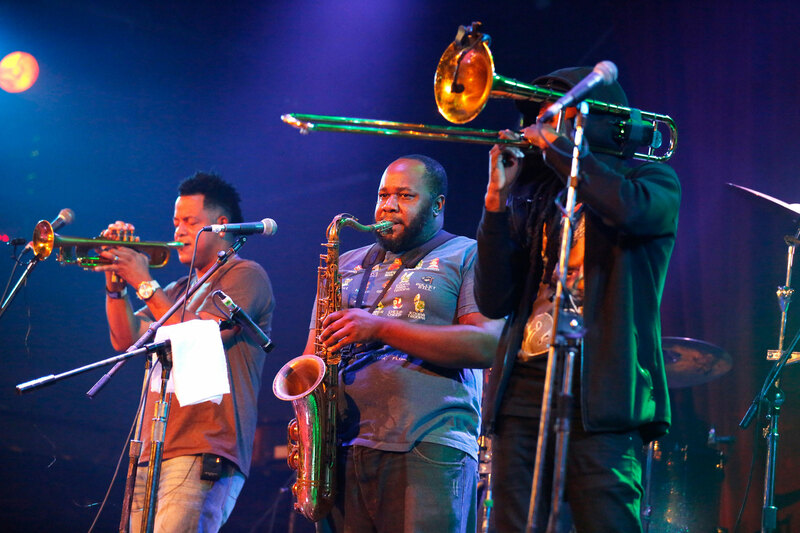 Along with their other jobs and family lives, The Soul Rebels average over 250 shows a year. They boast opening for artists like Metallica and Snoop Dogg, Marilyn Manson and Green Day. The group was shaped by the colorful culture of the marching and brass bands of New Orleans and grown together through the traumas of Hurricane Katrina. The group played their instrumental rendition of the ’80s pop hit “Sweet Dreams are Made of This” and Kanye West’s “Touch the Sky” from their “Power=Power” mixtape released in 2013 that covered other popular tracks. 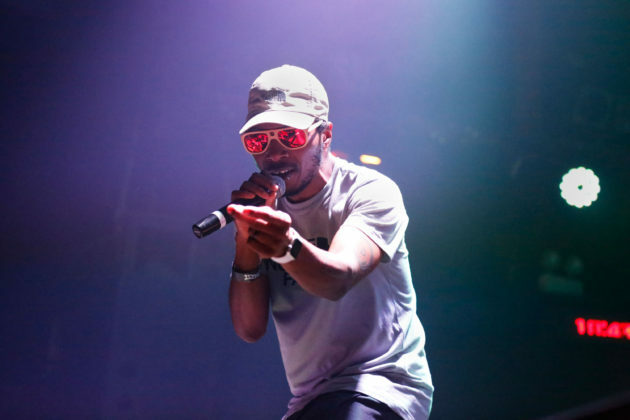 Throughout the evening, a couple hundred people trickled in and out, filling up the floor for opener Del the Funky Homosapien — a G-funk master who has collaborated with groups like Wu Tang Clan and the Gorillaz. G-funk is a subgenre of hip-hop that surfaced in the early ’90s, generally characterized by synthesizers and slower-paced rapping. The Oakland hip-hop artist and cousin of Ice Cube appeared from smoke in a white hoodie and reflective shades, rapping “If You Must”, in which he recounts smelling the bad breath of a stranger beside him on BART and wanting to pass him a stick of gum. The crowd rapped along with him, celebrating his out-of-the box lyrical meaning. 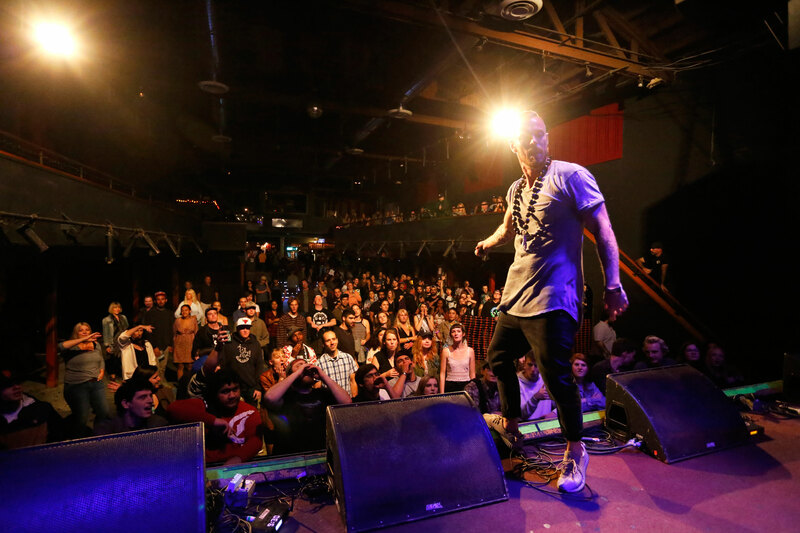 Pure Powers, who took the stage before Del the Funky Homosapien, noted Del’s successful channeling of both pure expression of self and hard cadence in his performance. Pure Powers acknowledged that street credit and ego are often added pressures to be well respected in the industry — Del inspired him to not put up a front to “be hard” in the hip-hop world. People came together on Friday to remember the classic origins of rap and listen to bonafide messages.